There are certain people, and I won’t name them, who believe that house plants are boring. For the most part these are men. 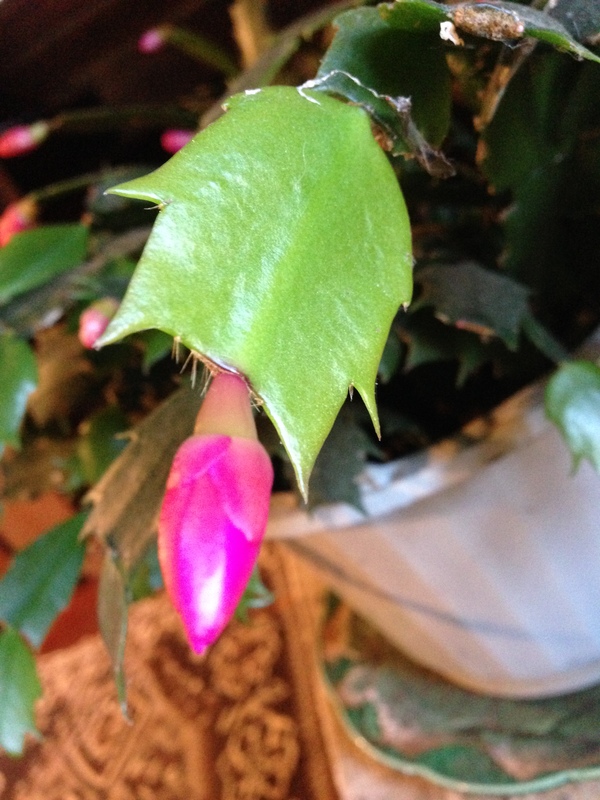 My Thanksgiving cactus has decided to get an early start this year, so it’s pushing out the new, light-green segments that are called “articles” with abandon, and showing off plenty of exciting hot pink buds. There, reader, are you male or are you female? Today, inspired by my Thanksgiving cactus, I went down the road to Kitchawan Farm and saw Linsay, who manages the place, and who was offering a pop-up sale of geraniums and other house plants, along with a warming fire, hot tea, fresh-dug jerusalem artichokes and the last field flowers of the year. On my way to the stuga, the cottage where the sale was taking place, I fed an apple to a horse with a splendid white blaze named Trix, who polished it off in a single bite. 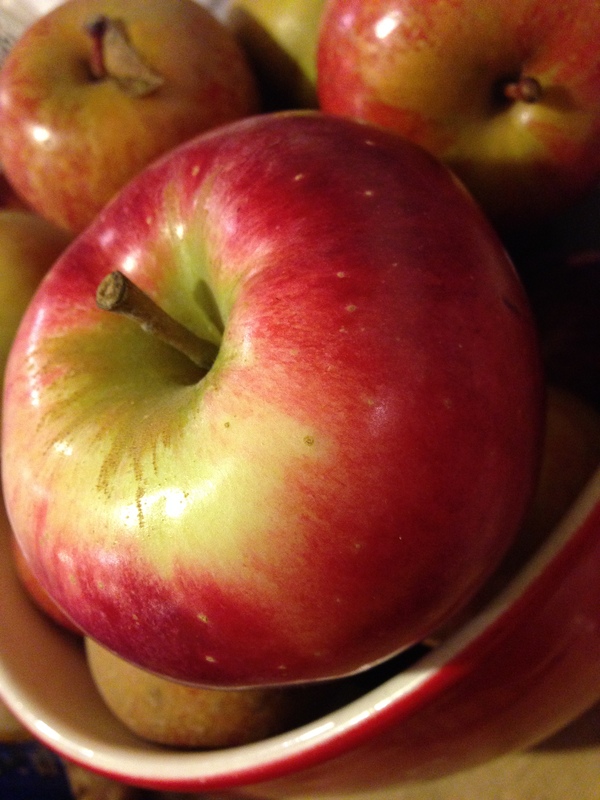 We had just come from Thompson’s Cider Mill and were loaded down with heirloom apples, Crispins and Russets and Jonathans, the kind that can’t be obtained in any supermarket, plus three huge Northern Spies for pie. Linsay knows quite a bit about house plants, among many other things. She has a hundred in her own home, and the ones on the two tables she’d set out came mainly from her own cuttings. Three dollars a pot, a good deal, expecially when it comes with a cup of hot tea on a bracing October day. In the shade beside the stuga she explained the habit of the walking iris, which might get away from you in a garden bed. At home I’ll keep a watchful eye on it. 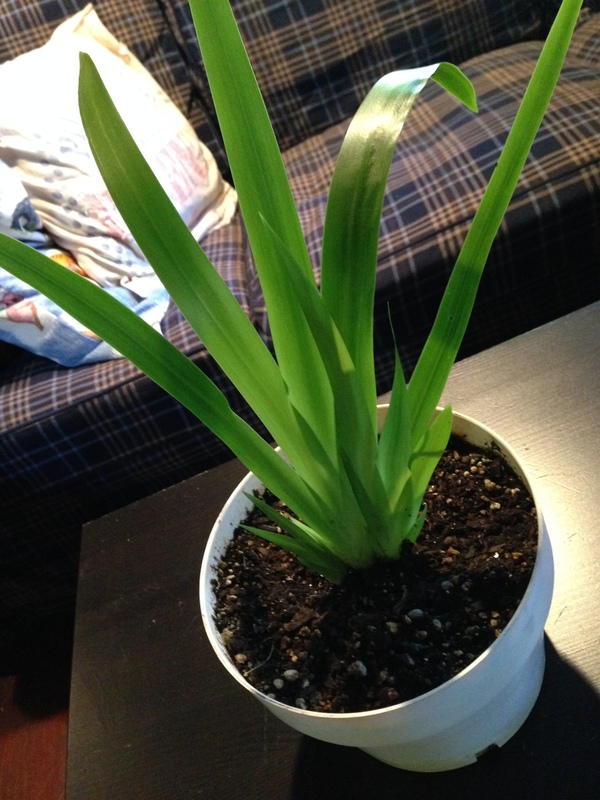 Some day soon it’s going to give me showy flowers that look like a cross between an orchid and an iris. I hope in the dead of winter, when there are snow drifts against the window. 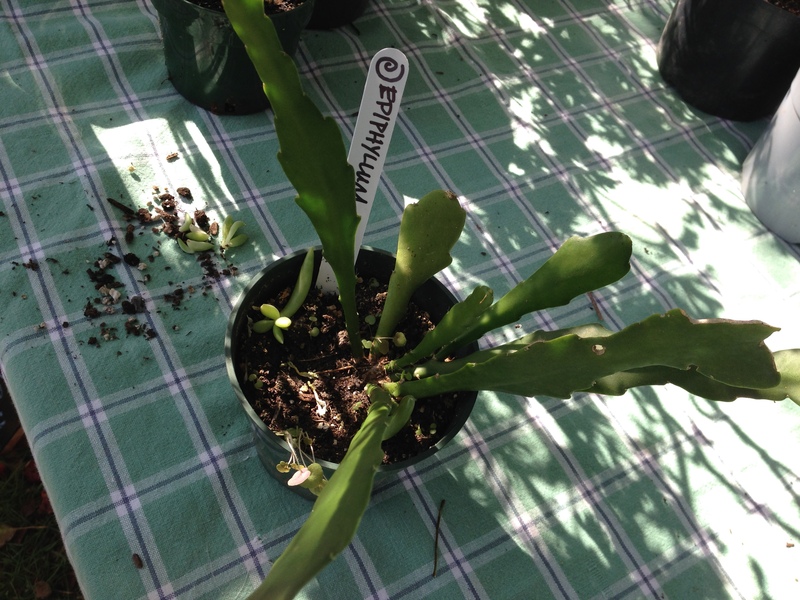 The epiphyllum, in the cactus family, hails from Central America, where it climbs trees and makes a strong hallucinogenic drink. It also promises a large red or white bloom, and, since it comes from the jungle, doesn’t expect much sun. Good, because sun is in short supply in the Cabin. Count me in. The geraniums were irresistable, especially the heirloom double rose type. Linsay has Sweden in her blood and convinced me that bright windowsills need at least one of this flower. So, realizing I did in fact have one sunlit spot, I got two. Why is it that geraniums have become associated with old ladies? Anyway, is there anything wrong with that? Even such a hipster as Bob Dylan liked them well enough to use the turn of phrase “geranium kiss” in Sad Eyed Lady of the Lowlands. Old ladies, I guess, have always known more about purifying the environment, keeping the air around you sweet-smelling and healthy. Spider plants as vitamins. It had been a hard frost last night, the first of the year, and at Kitchawan they’d managed to harvest all the cutting flowers. 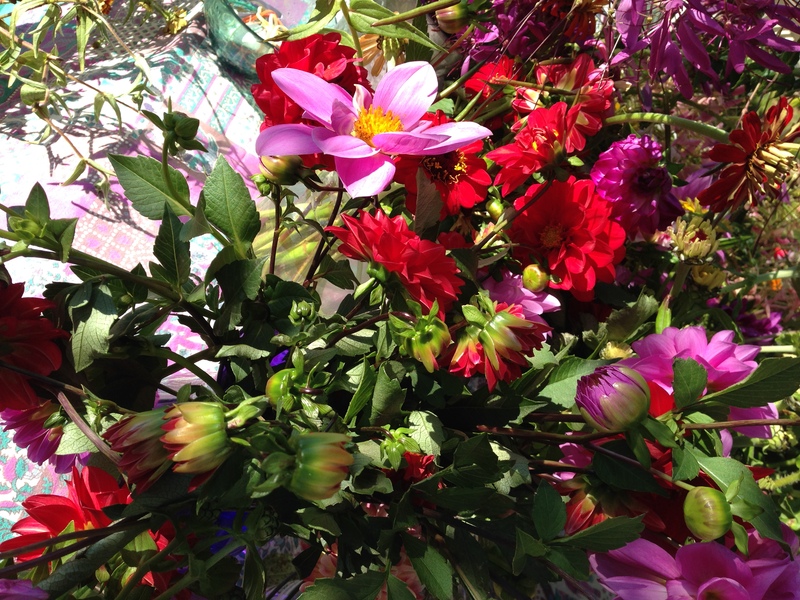 Dahlias, my favorite, and zinnias, and a dozen other varieties with the spice of fall. Lavish, bursting with color, unlike the demeanor of some house plants, which might be demure and even a little forlorn at times. 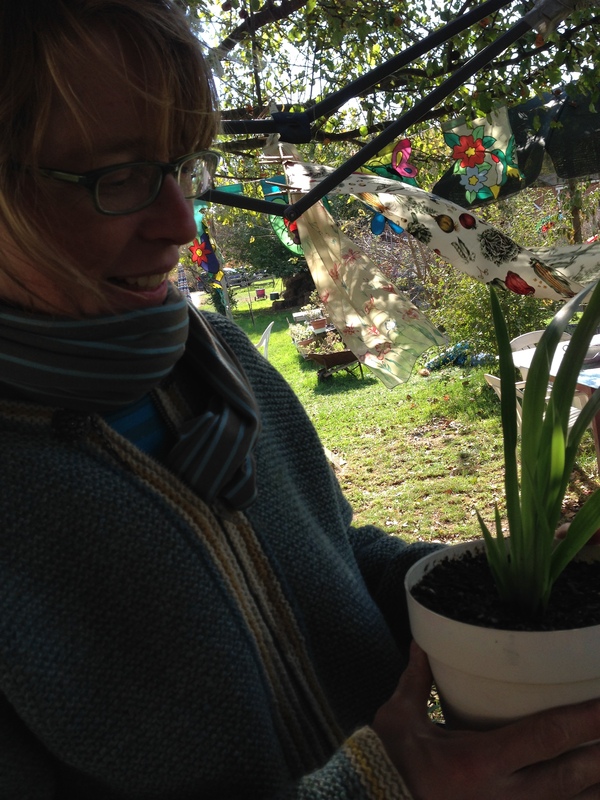 Linsay was making a specially crafted bouquet for every person who bought a plant. It was kind of sad, she said, and kind of a relief for the season to be over. Now she could get to her other projects, her writing and her art, and do her other job of helping people organize their lives. She organizes her plants with equal dedication. And here’s the thing. People who take these cuttings and nodules and hopeless-looking sections of stem, pot them up, test the soil, sprinkle in the proper quantity of water – they have a strong desire to organize, to fertilize, to nurture. To make things right. My mother, my best friends, the finest women I know have been wed to their house plants. 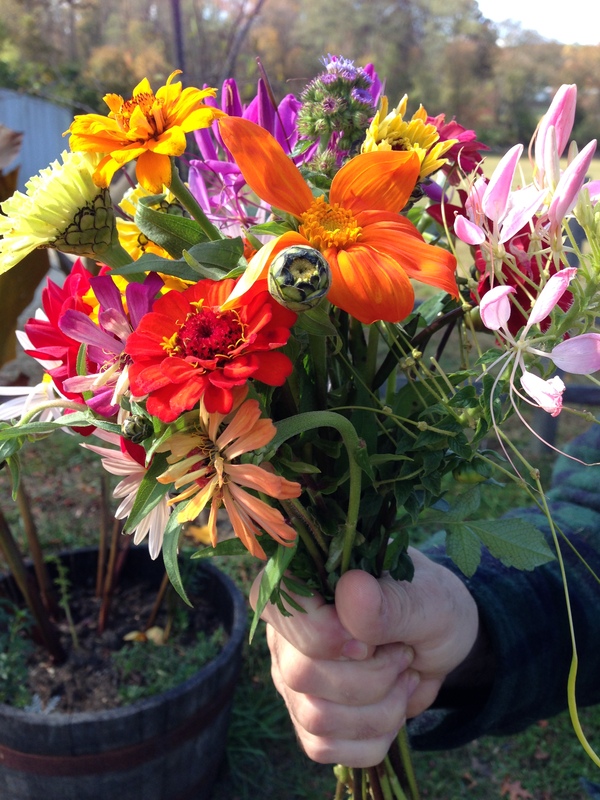 Not that there’s anything wrong with a shockingly beautiful fresh-flower bouquet. I’ve divided my last year’s overgrown aloe vera into four new pots, found the offspring four new homes at windows where the light is just right. I want to be an old lady. A capable, nurturing lady, old or young. Hahaha… I chuckled at least five times as I read this blog of yours, today. 1. The *articles* of new growth on your cactus… I didn’t know. 2. I am excited by the cactus bud; therefore, I must be female. 3. 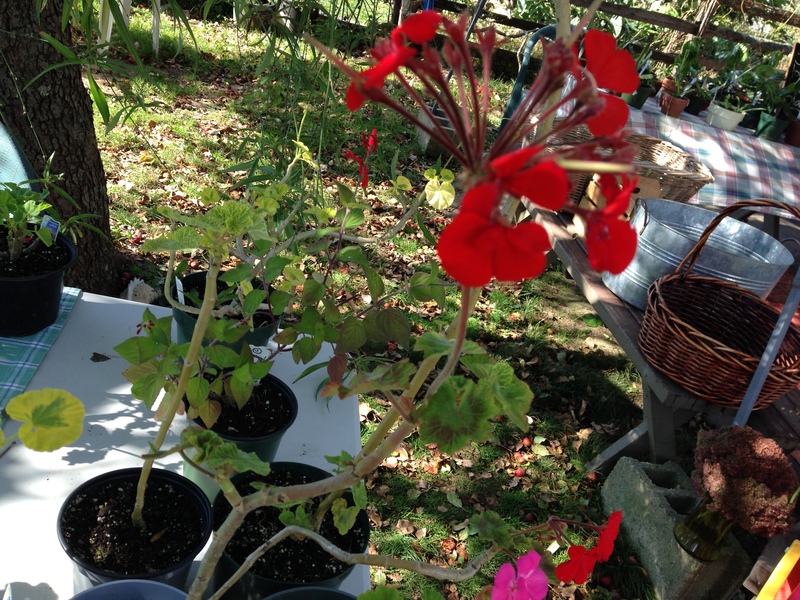 How fondly I recall my three huge pots of over-wintering geraniums in Nebraska… plenty of sun = plenty of flowers, all winter; heavy to carry to the kitchen sink for watering, but worth the effort. 4. The Northern Spies sound like some unpopular individuals who lurked around 17th century New Amsterdam. 5. Yes, I guess I was already an old lady, too, thirty-five years ago, when I was wed to my houseplants, my ferns and that big rubber tree, the dracaenas and pothos, an infinite number of Chinese evergreens, the African violets and babies’ tears, the oxalis for St. Patrick’s day, and several very successful ficus trees (one with a braided stem) … long before my wintering geraniums. Thanks for the vote of confidence. I was a bit tongue in cheek, I must admit. But I do love an old lady who knows how to divide a begonia. Jean, I feel I must take exception to your apparent feeling that you are old. I have seen old, and I know it’s face. Actually, what I have seen is enfeeblement. When people give in to sadness, when they give up the idea that they are useful to anyone, when they decide it’s time to spend time in their metaphorical rocking chairs, they lose a lot of themselves. They stop doing what they found enjoyable before. They live for small moments and are sad between, and they stop hoping. Their minds and hearts shrink along with their bodies. They cease to take care of themselves. That is what old looks like. So it is from this place in my head that I tell you that you are not an old lady. You are very far from it. In fact, you will probably not be old until your grandchildren are teenagers, or perhaps when you are in your 90s. Your tastes and sensibilities have changed because you have gained perspective, but you are not old. YOU are mature, and you are wise. Still very vibrant, like that end-of-season bouquet, but wise, nonetheless.